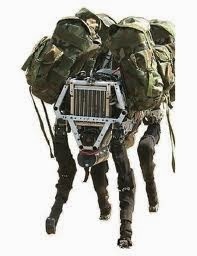 BigDog Robot: United States Military is going to use this amazing robot instead of mules to carry equipments. This can be used in any sort of conditions. In the video you can see the exceptional balancing of robot. It can climb through inclined area, walk through snow, run and jump. Here is the amazing video of "Boston Dynamics (DARPA) BIGDOG Robot". In the next video you will find How this robot tossing cinder blocks across a room.